The UK government has announced plans that would see camera drone users needing to register their devices and undergo flight safety lessons. The plans, which are detailed on the government's website, include the mandatory registration of all drones weighing more then 250g. 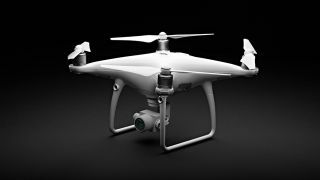 Many current popular models, such as the DJI Mavic and Phantom 4 Pro (pictured above) would be affected by the proposals. DJI itself is said to have welcomed the move. The measures follow an increasing number of security incidents involving drones around airports and prisons. "The UK is at the forefront of an exciting and fast growing drones market and it is important we make the most of this emerging global sector," said Aviation Minister Lord Callanan. "But like all technology, drones too can be misused. By registering drones, introducing safety awareness tests to educate users we can reduce the inadvertent breaching of airspace restrictions to protect the public." The government has has also stated that it intends to expand the use of geo-fencing, which uses GPS coordinates to create an invisible shield around buildings and sensitive areas such as airports. Currently, anyone found endangering the safety of an aircraft can be jailed for up to five years. Last year, the government worked with the Civil Aviation Authority (CAA) to develop a code for drone users. The code details that users must keep their devices below 400ft to avoid clashing with aircraft, and keep a distance of 50m away from people and properties.